Pairing Summer salads of all kinds – including chicken salad, potato salad, watermelon & feta salad, seafood salad, lobster salad. Also, the funky notes on this beer will help your palate cut through fried or fatty foods, like fish & chips, pies, and funky cheeses. As mentioned in yesterday’s blog post, it’s our 7th birthday coming up this Sunday, July 1st, which means a big party with BBQ and all the fixin’s, a band, and plenty of brand new beers! Yesterday, we unveiled the details of one of the new beers – a tart and tasty Peach & Apricot Pinot Noir Barrel-Fermented Sour. If you are a fan of innovative, barrel-fermented beers like this one, you should love the sounds of the beer we are unveiling today – Cuvée de la Hobbs Farm! 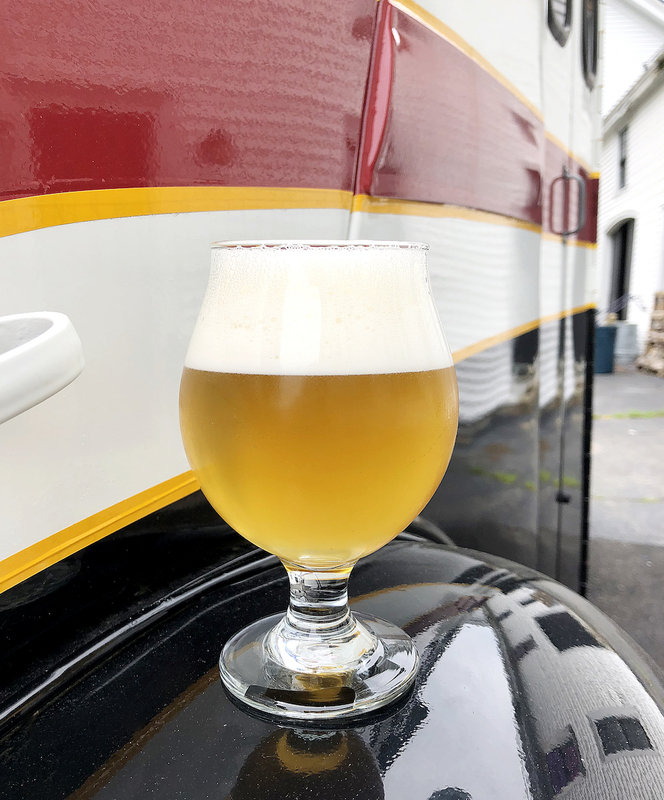 Cuvée de la Hobbs Farm is a special mixed fermentation golden ale that’s been brett-fermented and blended from two different barrels- one white wine and one gin. The result is a clear, straw-colored beauty with a funky, fruity, and pineapple aroma, made even better with flavors of white wine, tropical fruit, oak, and pineapple, followed by a slightly funky spiciness. This is a really special, time-intensive beer that took us many months to perfectly ferment, age, and blend. We think it is special enough to release for our 7th birthday, but we’d love for you guys to come and give it a try and let us know what you think! – Appearance: this is a golden, straw-colored ale with a full, fluffy off-white head. As you drink the beer, you should got a very attractive lacing along the side of your glass. – Aroma: Those of you that your love funky, Brett beers are going to love the smell on this beer! We get that characteristic barnyard funk (so common in Brettanomyces-fermented beers), but it’s enhanced by big pineapple and sweet tropical fruit notes. – Taste & Mouthfeel: While many beers taste exactly like they smell, this beer is surprisingly light, crisp, and refreshing given its funky aroma. Don’t get me wrong, the beer finishes with a slight funky spiciness, but the predominant flavors on this beer are white wine, tropical fruit, pineapple, lemon, oak, and crisp pilsen malt. In terms of mouthfeel, this beer is on the lighter side and finishes dry – akin to drinking a dry white wine. – Pairing: Summer salads of all kinds – including chicken salad, potato salad, watermelon & feta salad, seafood salad, lobster salad. Also, the funky notes on this beer will help your palate cut through fried or fatty foods, like fish & chips, pies, and funky cheeses. – Serving glass: We’ll be serving this beer in a 12-oz glass here at the Brewery. – Stats – ABV 5.7% and 37 IBU. Lucky Sevens Double IPA – our anniversary beer – featuring seven types of grains, seven varieties of hops, and weighing in at 7.77% ABV! Tasting notes coming soon! Sancho (Panza) – we are releasing a sidekick to our Donkey-Hoté double IPA. This beautifully hazy, golden-colored 6.1% ABV New England IPA is brewed with Eureka, Citra, Amarillo, & Galaxy hops, and it’s getting high early praise from our team! Tasting notes coming soon! Cuvée de la Hobbs Farm will go on tap here on July 1st for our 7th Birthday Party! Come on by and give it a try!